Statistical Process Control Kits, or SPC Kits, are the first complete packages that will help you obtain the utmost quality from any 15 kHz or 20 kHz ultrasonic welder. 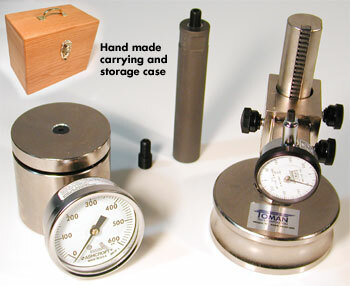 Each SPC Kit contains three components: an Amplitude Gauge, an Amplitude Test Horn and a Hydraulic Load Gauge. The SPC kit also includes a hardwood carrying case. With proper use, the kit’s components allow you to determine exactly how each welder is performing and to precisely duplicate welding parameters from unit to unit. Consistent and correct amplitude is one of the most important factors in achieving a high-quality ultrasonic weld. The Amplitude Gauge makes measuring and setting that amplitude easy. Simply bring the gauge into contact with the ultrasonic horn and read the total amplitude, in microns, on the gauge dial. Use the gauge to determine a variance in amplitude from welder to welder, to indicate bad or unbalanced horns, or to check for horn overstressing which, found early, will save many horns from cracking. The gauge features rack and pinion adjustments for ease of operation and a total amplitude reading in microns, eliminating the need for conversion. This test horn in conjunction with the Amplitude Gauge to measure the exact amount of amplitude being generated by the converter and booster. The Amplitude Test Horn has no built-in gain, so the reading at its face is the actual amplitude being generated by the converter and booster. This gauge measures the actual force that the welder is applying to the part being welded. It’s a must for insuring consistent weld pressure between machines. Because different welders have different size press cylinders, the same reading on the pressure gauge of each machine does not mean the actual down force at the horn is the same. 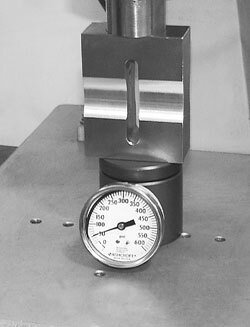 The Hydrauic Load Gauge removes the guesswork. Simply bring the horn down on the load gauge. Then, adjust the machine’s pressure until you have the desired down-pressure reading on the load gauge. Do this on each machine to duplicate welding parameters. At half the price of a load cell, the load gauge will soon pay for itself in reduced scrap parts.